Combining David Grove's work with the latest developments in self-organizing systems theory and cognitive linguistics resulted in Symbolic Modelling, described in our book, Metaphors in Mind. We regard Clean Space as an extension of Symbolic Modelling because, like Clean Language, it facilitates the client to self-model; it requires 'clean' interventions; and it works directly with the metaphoric realm. Our description of Clean Space is derived from observing David Grove facilitating individuals in small groups during 2 or 3 day retreats. 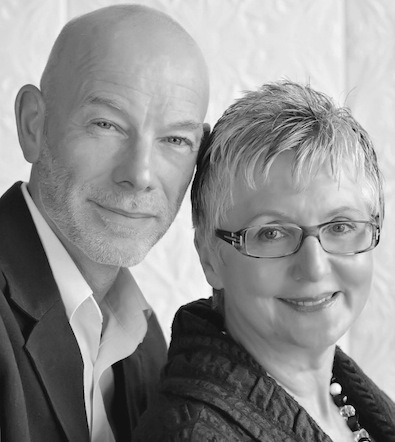 Over the last year we have been testing and refining our model, both in our private psychotherapy practice and with executive coaching clients in business. We have also introduced Clean Space to groups. At the NASA Goddard Space Center in Washington DC, Clean Space was used as a creativity process with 30 members of a cross-functional team. And we have used Symbolic Modelling and Clean Space over a four-day period to facilitate 80 members of The Findhorn Foundation spiritual community in Scotland to explore, clarify, plan and implement a joint outcome. Whenever we see something, we see it somewhere; whenever we hear a sound, it's coming from somewhere; and whenever we touch something, we feel it somewhere. Likewise, whenever we create an image in our mind, we see it somewhere; whenever we hear a sound internally, we hear it coming from somewhere; and whenever we feel a feeling inside, we feel it somewhere. Neuroscientists tell us there are no actual images, sounds or feelings in the brain, but subjectively it seems like there are. In other words, our representations are metaphors that exist in a mindspace -- a stage in the theatre of our mind where the play of consciousness is enacted. 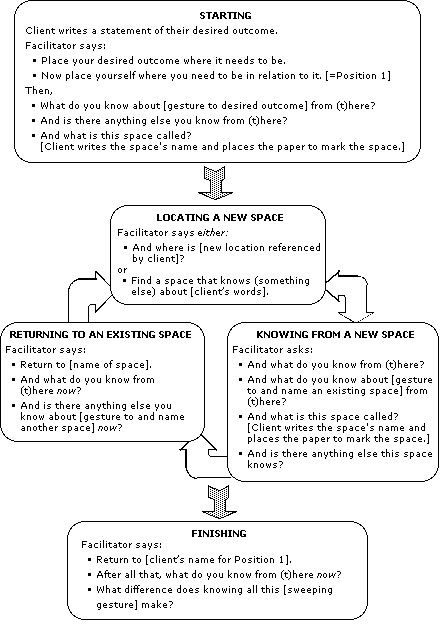 As you will see, Clean Space makes full use of the discovery that space is the medium or context for thought itself. Robert Dilts has made a significant contribution to NLP through the use of 'spatial sorting'. He has designed a number of processes such as Perceptual Positions, Neuro-Logical Levels, SCORE and Timeline that enable us to 'sort' and 'anchor' our thoughts and feelings into different physical places. In these processes the practitioner specifies a number of categories and allocates each of them a space. In Perceptual Positions for example, first, second, third and sometimes a fourth position are given a location by the facilitator. The facilitator provides the characteristics associated with these spaces, often with metaphors such as: 'seeing out of your own eyes', 'standing in the other person's shoes', 'a fly-on-the-wall position'. The facilitator guides the client through a sequence of moves from position to position -- usually with the liberal use of metaphors to instruct the client to 'leave that experience there', 'step out of that', etc. In these techniques the location of the space, the form of the perception, and the order of moves are to varying degrees predetermined by the facilitator. Clean Space is like doing a mixture of Perceptual Positions, Neuro-Logical Levels, etc. without the facilitator defining any of the spaces; or deciding the category of experience allocated to the spaces; or predefining the number of steps. In Clean Space, each position is located by the client and its attributes are defined by the client. The whole process emerges out of the client's innate ability to, as Gilles Fauconnier and Mark Turner put it, "conceptually blend" their perception of metaphorical space with their perception of physical space. Very simple rules can produce endlessly complex behavior. Traditional intuitions about how systems work are counterproductive when modelling complex systems. Therefore a new kind of intuition is required based on the observation and analysis of many examples of complex behavior emerging from simple interactions (we call this 'bottom-up modelling'). Clean Space is not like a traditional technique: the steps cannot be predefined since neither you nor the client knows what will happen next. Each move is contingent upon what has just been said or done and on the logic of the client's information. How many spaces the client identifies, their location, the order in which they are located, the information emerging from each space, and the number of iterations are determined during the process. Clean Space is a developmental model that recognises that complex-adaptive systems (people) learn through embodied activity, feedback and iteration. The result is an emergent property which was not predictable from the underlying rules or initial conditions. Clean Space is a new way to utilize bottom-up modelling in human psychology. For the client to model a network of relationships between the spaces, rather than to just develop the information contained within the spaces. - The client starts by placing their desired outcome statement and locating Position 1. - They are facilitated to use the Locating, Knowing and Returning routines iteratively. - The client completes the process by returning to Position 1. - Remember you are facilitating the client to self-model. - Change occurs as a result of the client's system self-reorganizing, not from your interventions. - Allow the client's process to unfold organically, in its own way and at its own pace. - Incorporate the client's exact words into your questions and directions, using as few of your own words as possible. - Do not comment in any way on what is happening. - Only ask one question at a time, and leave plenty of response-inviting pauses. - The more psychoactive the space becomes the more the space will be your co-facilitator, and the less you will need to do. Repeatedly return the client to Position 1 and to 'Sweet Spots' (spaces where there is a lot of new knowing). Only spend a short time in each space. You can use Clean Language to briefly develop the client's metaphors, but keep the process moving by inviting the client to move to new spaces or to revisit existing spaces. a particular space or group of spaces and make your gaze and gestures congruent with the location of the client's spaces. - Notice the spaces the client refers to implicitly, and invite them to move there. - If the client seems to be talking from a different space than the one they are occupying, move them to that space. - Clients indicate a higher-level knowing when they name a group of spaces, a relationship between spaces, or a metaphor for a configuration of spaces (lines, shapes, angles, edges, etc.). Use the client's word(s) for the grouping of spaces to refer to them as a whole. Be sure the client completes the process in Position 1. This is their 'control position' from which they can notice any changes that have occurred during the session. It is from here that they leave to continue their lives. David Grove says, "your aim is for the client to establish a network of relationships between the spaces." Once this configuration is established, the client's natural ability to detect patterns and make meaning, coupled with their desire to change, results in the system learning from itself. When you facilitate Clean Space, your language, gaze and gestures must be clean. That is, all that you say and do needs to be congruent with the client's mental landscape from their perspective. This means resisting the temptation to add in your own words. The moment you do this the client has to stop modelling them self, and start modelling you. This applies not only to meta-comments, reframes and Ericksonian language, but also to those apparently innocuous additions such as "Tell me what you know from there." The 'tell me' unnecessarily brings the facilitator into the equation and implies a dialogue rather than an exploration by the client of the logic of their own perceptions. Most people naturally scale their inner landscape to fit the dimensions of the physical space available. We have successfully facilitated clients in small rooms as well as outside where some of their spaces were 200 metres apart. The client's desired outcome can be anything they want. It does not have to fulfil any 'Well-formedness Conditions' or SMART criteria. It is important however, that the desired outcome is in their own words, and written (or drawn) by their hand -- uncontaminated by any comments, suggestions or leading questions from the facilitator. The client may rewrite their statement at any time during the process. You may also find that the client starts moving to new spaces and returning to existing spaces of their own accord. When this happens you know they are self-modelling. Once space becomes psychoactive it is imbued with meaning, and the client is likely to discover deep significance in the coincidence of events and the location of objects. These synchronicities should be incorporated into the process. For example, a client who wanted to "discover his next steps" was being taken though the Clean Space process in a public park. He was standing in one of his spaces when he turned to see a workman in a pond pulling a "No Waiting" sign out of the water. As client and facilitator watched in amazement, wondering whether they should believe their eyes, the workman fished around under the water and brought a second "No Waiting" sign to the surface. The client exclaimed, "I might be able to ignore one sign, but not two!" The facilitator simply replied, "Find a space that knows about not being able to ignore two signs." The Clean Space process can easily continue across sessions. At the end of a session, invite the client to map the configuration of their spaces. At the start of the following session, the client can replace their desired outcome and position labels as before. When they are in Position 1, they can notice if anything has changed. Whether it has or not, the next phase of self-modelling will have already begun. With Clean Space the client lays out the content of their mind in an embodied process that enables them to figure out (self-model) how it all fits together. Amazingly, no specific change technique is required. Clean Space relies on the client's natural ability to utilize emergence. Change happens organically as a result of the client's system becoming more aware of its own organization. As Milton Erickson said, "Therapy results from an inner resynthesis of the patient's behavior achieved by the patient himself" (quoted by Ernest Rossi). Clean Space is a very flexible process that can be adapted in hundreds of ways. It can be used by individuals to solve problems, to stimulate creativity, as a way to prepare for exams (it's like walking around your own personalized mind map), and as a generative development process. We have also used it with couples, in conflict resolution and negotiation, and in group facilitation. Clean Space can easily be incorporated into other methodologies. However, we strongly recommend that you first trial it several times in its pure form. Not only will your clients discover some surprising things about themselves, you are likely to notice how little you need to do. Generally, the less you try to make something happen, the more something unexpectedly productive happens. To appreciate the full implication of Clean Space you will need to experience it from the client's perspective. Afterwards you will have a better idea of how creating a psychoactive perceptual space and moving around it engages much more than ordinary cognition. We'll leave the last word to one of our clients: "I couldn't see how standing on another piece of carpet could make any difference, and yet when I did, I instantly had access to new knowledge, and that opened up a completely new perspective." In 2009 we undertook a major review and updating of the principles, methodology and choices available to a Clean Space facilitator, see: Clean Space Revisited. And in 2012: James wrote a blog, Setting Up Clean Space, which focuses on the artistic (rather than the technology) aspect of Clean Space. 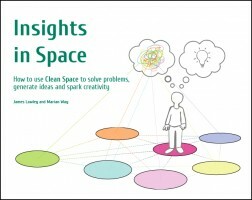 And in 2017: James and Marian Way wrote the first book dedicated to Clean Space and it's applications, including how to use it with groups, Insights in Space: How to Use Clean Space to Solve Problems, Generate Ideas and Spark Creativity. 1. See also in Anchor Point: Watch Your Language! March 2001; A Case Study May 2001; A Model of Musing, May 2002. 2. The facilitation team at Findhorn also included Steve Callaghan, Phil Swallow, Wendy Sullivan, Caitlin Walker and Marian Way. Robert Dilts, Changing Belief Systems with NLP, Meta Publications, 1990. Gilles Fauconnier and Mark Turner, The Way We Think: Conceptual Blending and the Mind's Hidden Complexities, Basic Books, 2003. Edward T. Hall, The Silent Language, Doubleday, 1981. Steven Johnson, Emergence: The Connected Lives of Ants, Brains, Cities and Software, Penguin, 2001. George Lakoff and Mark Johnson, Metaphors We Live By, The University of Chicago Press, 1980. James Lawley and Penny Tompkins, Metaphors in Mind: Transformation through Symbolic Modelling The Developing Company Press, 2000. Steven Pinker, How the Mind Works, The Softback Preview, 1998. Ernest Rossi, The Psychobiology of Mind-Body Healing, Norton, 1993. Stephen Wolfram, A New Kind of Science, Wolfram Media, 2002. Thanks to the London Clean Language and the Metaphor Practice and Research Groups for their continued exploration, challenge and development of our model of Clean Space. And to Philip Harland and Phil Swallow for their useful feedback on this article.